Vom 7. bis 9. März findet dieses Jahr die 10. therapie Leipzig statt. Mit rund 16.100 Fachbesuchern im Jahr 2017, hat die therapie Leipzig ihre Position als größtes und bedeutendstes Branchenereignis für Therapie, medizinische Rehabilitation und Prävention in Deutschland bewiesen. Alle zwei Jahre findet die therapie Leipzig statt und verbindet interdisziplinäre Fortbildung mit nationaler Produktschau, an der alle führenden Unternehmen der Branche teilnehmen. Besuchen Sie uns in Halle 2 Stand C39. Wir freuen uns auf Sie. From the 7th to the 9th of March the 10th therapie Leipzig will take place this year. 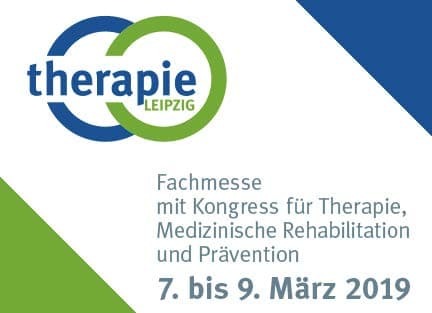 With around 16,100 trade visitors in 2017, the therapie Leipzig has proven its position as the largest and most important fallow event for therapy, medical rehabilitation and prevention in Germany. The therapie Leipzig takes place every two years and combines interdisciplinary training with a national product show in which all the leading companies in the industry participate. Visit us in hall 2 booth C39. We are looking forward to see you.